Chest pain presents itself in many forms, ranging from dull aches to a sharp stabbing sensation. It can feel like crushing or burning, and in other cases, the pain travels up into the neck, jaw, and then radiates to the back or down one or both arms. Various problems can cause chest pain, but the most serious and life-threatening causes involve the lungs and heart. Since chest pain is often an indicator of a serious problem, medical help should be sought immediately. One of the most common complaints people make when visiting the emergency department is chest pain. Chest pain caused by reduced blood flow to the heart is known as angina. Angina presents with a feeling of tightness, squeezing, heaviness, burning, and pressure behind the breastbone. Other symptoms include pain in the upper central abdomen, back, neck, jaw, or shoulders; nausea; fatigue; breathlessness; sweating; and dizziness. 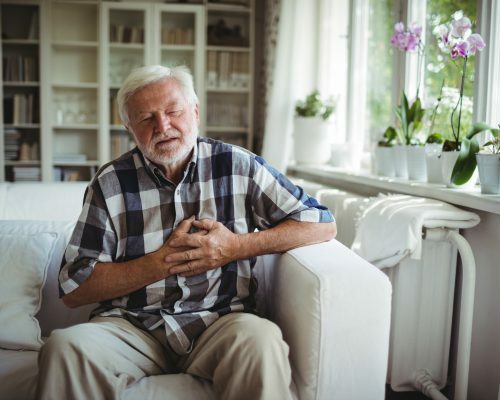 To treat angina, medication prescribed by a doctor is the primary solution, however, there are home remedies for chest pain and angina you can try. The following may help to reduce the blockage in the arteries and reduce the frequency of or relieve the chest pain completely. Provides relief from chest pain due to its high concentration of capsaicin, an anti-inflammatory agent. It also works as a blood regulator to restore circulation of blood to the heart. To use it as a health remedy, add one teaspoon of cayenne pepper powder to a glass of milk or fruit juice. Drink it in one go to alleviate the pain. You can also take it as a supplement after consulting your health practitioner. A good remedy for chest pain, basil contains magnesium, which promotes blood flow by helping the heart and blood vessels relax. It also contains the antioxidant vitamin A, which prevents cholesterol buildup in the blood vessel walls. When you experience chest pain, chew 10 fresh basil leaves or drink a cup of basil tea to get relief. To prevent chest pain and improve your heart’s health, take a teaspoon of fresh basil juice with one teaspoon of honey and consume it daily on an empty stomach. Alfalfa is effective in reducing chest pain as it reduces cholesterol levels and plaque buildup, ensuring smoother blood flow to the heart. Alfalfa also contains adequate amounts of chlorophyll, which softens arteries and reduces the frequency of chest pain. To consume it, make a warm alfalfa tea by adding one teaspoon of dried leaves to a cup of hot water. Steep for five minutes, strain, and enjoy. You can also take supplements daily to reduce the frequency of chest pain. This plant product can promote cardiovascular health and prevent chest pain like angina. It also has antioxidant and cardio-protective properties, which reduce cholesterol and promote blood flow to the heart. To consume, add one teaspoon of fenugreek seeds to one and a half cups of water and boil for five minutes. Strain, add two teaspoons of honey, and drink. As a preventative measure, eat soaked fenugreek seeds daily. Rich in polyunsaturated fatty acids, almonds can reduce blood cholesterol levels and promote heart health. It is also rich in plant sterols, fiber, and magnesium. To reduce pain, mix equal amounts of almond oil and rose oil. Rub it gently over your chest and soon the pain will subside. To reduce the risk of chest pain and other heart diseases, eat a handful of roasted almonds daily. A common cause of chest pain is gas, and drinking a warm or hot drink will help activate your digestive system to ease gas and bloating. Hot hibiscus tea supports digestion and heart health, and research has shown it helps lower blood pressure while reducing cholesterol and triglycerides. Another common cause of heart pain is chest muscle strain from weightlifting, a fall, or even carrying a child. Inflammation of the chest wall (costochondritis) is often the cause of severe chest pain. Applying a cold pack several times daily to the affected area can reduce inflammation and ease pain. This type of vinegar aids digestion, preventing gas production in the abdomen, which in turn reduces chest pain. Simply consume two teaspoons of ACV in the event of chest pain. Also read: Gas pain in chest: How to get rid of pain in chest when stomach is bloated? Instead of consuming meat and dairy regularly, choose a vegetarian diet. Less fat and less cholesterol can reduce many of the minor symptoms of angina pain. Eating vegetables, especially green ones, controls angina and helps maintain overall health. To fight angina daily, you can consume citrus fruits like lemon, pineapples, oranges, and grapes. Vitamin C also helps manage cholesterol levels. Water flushes out excess sodium that causes hypertension and high blood pressure. These symptoms can lead to angina pain and coronary heart disease. You should drink about eight ounces of water every two hours, and two liters of water is the daily recommendation for the average adult. Not getting enough water can lead to dehydration, causing headaches, irritability, dizziness, irregular heartbeat, and shortness of breath. The most important part of eliminating and preventing chest pain is to start healthy life habits now. Maintaining a healthy diet, incorporating moderate exercise, and taking time to get enough rest and relaxation are essential to good health. Incorporating any of the above home remedies and lifestyle changes can help you keep angina pain at bay so you can enjoy a happy, productive life. If you do have angina or chest pain, it is important you understand the symptoms and do what it takes to limit them as best as you can. This will require the assistance of your doctor and lifestyle changes on your part. What causes retrosternal chest pain?